Roberto Di Matteo was just a few minutes away from becoming the poster boy for every club chairman/CEO aching to fire their coach for a string of bad results. Had Chelsea won last night and they would have made it 5 wins in 5 games under Di Matteo. As it is, the Londoners were brought down to earth and should be thinking in terms of Europa League. Manchester City were very strong for the first ten minutes. With Cahill taking the injured John Terry's place, Chelsea are less intense and more vulnerable to short diagonal movements between Cahill and his full-back. This meant David Luiz was the left centre-back, a position he's much more used to and where he's most effective. Chelsea's plan was obvious, apparently drawing inspiration on Sporting's display in the last Europa League tie against City: drop back with two banks of four and let Torres take full advantage of his newfound happiness, with Meireles as the link-up man. In fact, the Spaniard was very good working the channels, but the Portuguese is clearly not cut out for this position, since his decision-making is not always that good and he is not the most proficient player with his back to goal. City were clearly the more dominant side, but it was clearly part of Chelsea's strategy. Apart from Samir Nasri's shot that hit the bar, the Citizens were only able to shot from distance, without being able to penetrate into the box. As has often been the case, Balotelli and Agüero showed that they are too prone to blowing hot and cold (nice moments of flare, but blatantly inconsistent) and that they are not very inclined to work and open up spaces for others. With opponents less and less inclined in going head-to-toe with City, Mancini's men are having a hard time finding free space. Even though Meireles was not offering a decisive contribution offensively, he was being successful at (almost) man-marking Yaya Touré out of the game. With the Ivorian stationed next to De Jong, Meireles' task was clearly to break up City's build-up play. Silva was missing and Touré had too many defensive duties. Mancini's furious reaction on the touchline was a clear proof that City were getting nothing out of the game. For the second half, Mancini brought on Gareth Barry for Balotelli, proving that less (attackers) is sometimes more. With the centre in good hands, Yaya Touré could finally break free and tread onto Chelsea's comfort zone - which meant Silva and Nasri were able to play farther up front, too. In turn, Meireles wasn't sure whether he was supposed to keep closing down Yaya Touré or stick to Barry. The goals had something of a chance factor in them. Chelsea's goal came from a deflection off Yaya Touré's leg and City's penalty was a desperate shot that hit Essien's arm. Apart from that (Nasri's mentioned effort aside), there were no clear-cut chances for either side and City's victory, while deserved, almost didn't happen. 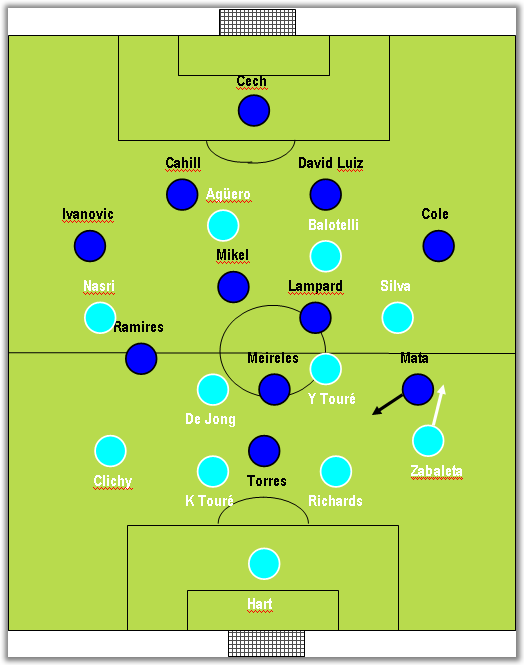 In the end, Mancini's gung ho approach - with Tévez, Dzeko and Agüero - proved too much for Chelsea. Nevertheless, Di Matteo's team is now more calm and collected, better organized and even Cech looks now like his old self, much less prone to mistakes and distractions.